The big difference between the wave equation and an ordinary diffusion equation is that the wave equation gives us two equations for the price of one: ψ is a complex-valued function, with a real and an imaginary part which, despite their name, are both equally fundamental, or essential. Whatever word you prefer. 🙂 That’s also what the presence of the imaginary unit (i) in the equation tells us. But for the rest it’s the same: the diffusion constant (D) in Schrödinger’s equation is equal to (1/2)·(ħ/meff). It fixes the numbers (so that’s its function as a mathematical constant). As a physical constant, it also fixes the physical dimensions. Note, for example, how the 1/ħ factor in ω = E/ħ and k = p/ħ ensures that the ω·t = (E/ħ)·t and k·x = (p/ħ)·x terms in the argument of the wavefunction are both expressed as some dimensionless number, so they can effectively be added together. Physicists don’t like adding apples and oranges. The question is: why did Schrödinger use ħ/2, rather than ħ, as a scaling factor? Let’s explore the question. We may want to think that 1/2 factor just echoes the 1/2 factor in the Uncertainty Principle, which we should think of as a pair of relations: σx·σp ≥ ħ/2 and σE·σt ≥ ħ/2. However, the 1/2 factor in those relations only makes sense because we chose to equate the fundamental uncertainty (Δ) in x, p, E and t with the mathematical concept of the standard deviation (σ), or the half-width, as Feynman calls it in his wonderfully clear exposé on it in one of his Lectures on quantum mechanics (for a summary with some comments, see my blog post on it). We may just as well choose to equate Δ with the full-width of those probability distributions we get for x and p, or for E and t. If we do that, we get σx·σp ≥ ħ and σE·σt ≥ ħ.
It’s a bit like measuring the weight of a person on an old-fashioned (non-digital) bathroom scale with 1 kg marks only: do we say this person is x kg ± 1 kg, or x kg ± 500 g? Do we take the half-width or the full-width as the margin of error? In short, it’s a matter of appreciation, and the 1/2 factor in our pair of uncertainty relations is not there because we’ve got two relations. Likewise, it’s not because I mentioned we can think of Schrödinger’s equation as a pair of relations that, taken together, represent an energy propagation mechanism that’s quite similar in its structure to Maxwell’s equations for an electromagnetic wave (as shown below), that we’d insert (or not) that 1/2 factor: either of the two representations below works. It just depends on our definition of the concept of the effective mass. 2. 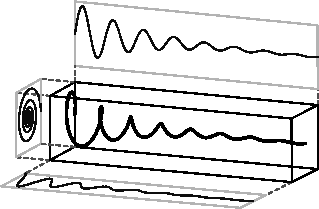 The energy concept in the wavefunction ψ = a·e−i·[E·t − p∙x]/ħ is, obviously, the total energy of the particle. For non-relativistic speeds, the kinetic energy is only a very small fraction of the total energy. In fact, using the formula above, you can calculate the ratio between the kinetic and the total energy: you’ll find it’s equal to 1 − 1/γ = 1 − √(1−v2/c2), and its graph goes from 0 to 1. In fact, it is fair to say that both definitions are equally weird, even if the dimensions come out alright: the effective mass is measured in old-fashioned mass units, and the β2 or β2/2 factor appears as a sort of correction factor, varying between 0 and 1 (for β2) or between 0 and 1/2 (for β2/2). I prefer the new definition, as it ensures that meff becomes equal to m in the limit for the velocity going to c. In addition, if we bring the ħ/meff or (1/2)∙ħ/meff factor to the other side of the equation, the choice becomes one between a meffNEW/ħ or a 2∙meffOLD/ħ coefficient. It’s a choice, really. Personally, I think the equation without the 1/2 factor – and, hence, the use of ħ rather than ħ/2 as the scaling factor – looks better, but then you may argue that – if half of the energy of our particle is in the oscillating real part of the wavefunction, and the other is in the imaginary part – then the 1/2 factor should stay, because it ensures that meff becomes equal to m/2 as v goes to c (or, what amounts to the same, β goes to 1). But then that’s the argument about whether or not we should have a 1/2 factor because we get two equations for the price of one, like we did for the Uncertainty Principle. So… What to do? Let’s first ask ourselves whether that derivation of the effective mass actually makes sense. Let’s therefore look at both limit situations. 1. For v going to c (or β = v/c going to 1), we do not have much of a problem: meff just becomes the total mass of the particle that we’re looking at, and Schrödinger’s equation can easily be interpreted as an energy propagation mechanism. Our particle has zero rest mass in that case ( we may also say that the concept of a rest mass is meaningless in this situation) and all of the energy – and, therefore, all of the equivalent mass – is kinetic: m = E/c2 and the effective mass is just the mass: meff = m·c2/c2 = m. Hence, our particle is everywhere and nowhere. In fact, you should note that the concept of velocity itself doesn’t make sense in this rather particular case. It’s like a photon (but note it’s not a photon: we’re talking some theoretical particle here with zero spin and zero rest mass): it’s a wave in its own frame of reference, but as it zips by at the speed of light, we think of it as a particle. 2. Let’s look at the other limit situation. For v going to 0 (or β = v/c going to 0), Schrödinger’s equation no longer makes sense, because the diffusion constant goes to zero, so we get a nonsensical equation. Huh? What’s wrong with our analysis? Well… I must be honest. We started off on the wrong foot. You should note that it’s hard – in fact, plain impossible – to reconcile our simple a·e−i·[E·t − p∙x]/ħ function with the idea of the classical velocity of our particle. Indeed, the classical velocity corresponds to a group velocity, or the velocity of a wave packet, and so we just have one wave here: no group. So we get nonsense. You can see the same when equating p to zero in the wave equation: we get another nonsensical equation, because the Laplacian is zero! Check it. If our elementary wavefunction is equal to ψ = a·e−i·(E/ħ)·t, then that Laplacian is zero. I must credit Oregon State University for the animation above. It’s quite nice: a simple particle in a box model without potential. As I showed on my other page (explaining various models), we must add at least two waves – traveling in opposite directions – to model a particle in a box. Why? Because we represent it by a standing wave, and a standing wave is the sum of two waves traveling in opposite directions. So, if our derivation above was not very meaningful, then what is the actual concept of the effective mass? Now, the b in this formula is the spacing between the atoms in the lattice. The A basically represents an energy barrier: to move from one atom to another, the electron needs to get across it. I talked about this in my post on it, and so I won’t explain the graph below – because I did that in that post. Just note that we don’t need that factor 2: there is no reason whatsoever to write E0 + 2·A and E0 − 2·A. We could just re-define a new A: (1/2)·ANEW = AOLD. The formula for meff then simplifies to ħ2/(2·AOLD·b2) = ħ2/(ANEW·b2). We then get an Eeff = meff·v2 formula for the extra energy. Eeff = meff·v2?!? What energy formula is that? Schrödinger must have thought the same thing, and so that’s why we have that ugly 1/2 factor in his equation. However, think about it. Our analysis shows that it is quite straightforward to model energy as a two-dimensional oscillation of mass. In this analysis, both the real and the imaginary component of the wavefunction each store half of the total energy of the object, which is equal to E = m·c2. Remember, indeed, that we compared it to the energy in an oscillator, which is equal to the sum of kinetic and potential energy, and for which we have the T + U = m·ω02/2 formula. But so we have two oscillators here and, hence, twice the energy. Hence, the E = m·c2 corresponds to m·ω02 and, hence, we may think of c as the natural frequency of the vacuum. So… Well… What do we do now? Do we use the 1/2 factor or not? It would be very convenient, of course, to just stick with tradition and use meff as everyone else uses it: it is just the mass as it appears in whatever medium we happen to look it, which may be a crystal lattice (or a semi-conductor), or just free space. In short, it’s the mass of the electron as it appears to us, i.e. as it appears in the (non-relativistic) kinetic energy formula (K.E. = meff·v2/2), the formula for the momentum of an electron (p = meff·v), or in the wavefunction itself (k = p/ħ = (meff·v)/ħ. In fact, in his analysis of the electron orbitals, Feynman (who just follows Schrödinger here) drops the eff subscript altogether, and so the effective mass is just the mass: meff = m. Hence, the apparent mass of the electron in the hydrogen atom serves as a reference point, and the effective mass in a different medium (such as a crystal lattice, rather than free space or, I should say, a hydrogen atom in free space) will also be different. Both would be correct, and it explains why Schrödinger’s equation works. So let’s go for that compromise and write Schrödinger’s equation in either of the two equivalent ways. 🙂 The question then becomes: how to interpret that factor 2? The answer to that question is, effectively, related to the fact that we get two waves for the price of one here. So we have two oscillators, so to speak. Now that‘s quite deep, and I will explore that in one of my next posts. Let me now address the second weird thing in Schrödinger’s equation: the energy factor. I should be more precise: the weirdness arises when solving Schrödinger’s equation. Indeed, in the texts I’ve read, there is this constant switching back and forth between interpreting E as the energy of the atom, versus the energy of the electron. Now, both concepts are obviously quite different, so which one is it really? To get this, you just need to actually to do that time derivative, noting that the ψ in our equation is now ψ(r), not ψ (r, t). Feynman duly notes this as he writes: “The function ψ(r) must solve this equation, where E is some constant—the energy of the atom.” So far, so good. In one of the (many) next steps, we re-write E as E = ER·ε, with ER = m·e4/2ħ2. So we just use the Rydberg energy (ER ≈ 13.6 eV) here as a ‘natural’ atomic energy unit. That’s all. No harm in that. We picked our zero point as the energy of an electron located far away from the proton? But we were talking the energy of the atom all along, right? You’re right. Feynman doesn’t answer the question. The solution is OK – well, sort of, at least – but, in one of those mathematical complications, there is a ‘normalization’ – a choice of some constant that pops up when combining and substituting stuff – that is not so innocent. To be precise, at some point, Feynman substitutes the ε variable for the square of another variable – to be even more precise, he writes: ε = −α2. He then performs some more hat tricks – all legitimate, no doubt – and finds that the only sensible solutions to the differential equation require α to be equal to 1/n, which immediately leads to the above-mentioned solution for our s-states. It’s a rather long quotation, but it’s important. The key phrase here is, obviously, the following: “For other problems, it may be useful to subtract from all energies the amount Mg·c2, where Mg is the mass of the whole atom in the ground state; then the energy that appears is just the excitation energy of the atom.” So that’s what he’s doing when solving Schrödinger’s equation. However, I should make the following point here: if we shift the origin of our energy scale, it does not make any difference in regard to the probabilities we calculate, but it obviously does make a difference in terms of our wavefunction itself. To be precise, its density in time will be very different. Hence, if we’d want to give the wavefunction some physical meaning – which is what I’ve been trying to do all along – it does make a huge difference. When we leave the rest mass of all of the pieces in our system out, we can no longer pretend we capture their energy. The offer is there: anyone who is willing to go through it and offer constructive and/or substantial comments will be included in the book’s acknowledgements section when I go for a second edition (which it needs, I think). First person to be acknowledged here is my wife though, Maria Elena Barron, as she has given me the spacetime and, more importantly, the freedom to take this bull by its horns. Another introduction to quantum mechanics? Yep. I am not hoping to sell many copies, but I do hope my unusual background—I graduated as an economist, not as a physicist—will encourage you to take on the challenge and grind through this. I’ve always wanted to thoroughly understand, rather than just vaguely know, those quintessential equations: the Lorentz transformations, the wavefunction and, above all, Schrödinger’s wave equation. In my bookcase, I’ve always had what is probably the most famous physics course in the history of physics: Richard Feynman’s Lectures on Physics, which have been used for decades, not only at Caltech but at many of the best universities in the world. Plus a few dozen other books. Popular books—which I now regret I ever read, because they were an utter waste of time: the language of physics is math and, hence, one should read physics in math—not in any other language. But Feynman’s Lectures on Physics—three volumes of about fifty chapters each—are not easy to read. However, the experimental verification of the existence of the Higgs particle in CERN’s LHC accelerator a couple of years ago, and the award of the Nobel prize to the scientists who had predicted its existence (including Peter Higgs and François Englert), convinced me it was about time I take the bull by its horns. While, I consider myself to be of average intelligence only, I do feel there’s value in the ideal of the ‘Renaissance man’ and, hence, I think stuff like this is something we all should try to understand—somehow. So I started to read, and I also started a blog (www.readingfeynman.org) to externalize my frustration as I tried to cope with the difficulties involved. The site attracted hundreds of visitors every week and, hence, it encouraged me to publish this booklet. So what is it about? What makes it special? In essence, it is a common-sense introduction to the key concepts in quantum physics. However, while common-sense, it does not shy away from the math, which is complicated, but not impossible. So this little book is surely not a Guide to the Universe for Dummies. I do hope it will guide some Not-So-Dummies. It basically recycles what I consider to be my more interesting posts, but combines them in a comprehensive structure. It is a bit of a philosophical analysis of quantum mechanics as well, as I will – hopefully – do a better job than others in distinguishing the mathematical concepts from what they are supposed to describe, i.e. physical reality. Hence, the argument of the wavefunction is just the proper time of the object with the rest mass acting as a scaling factor for the time: the internal clock of the object ticks much faster if it’s heavier. This symmetry between the argument of the wavefunction of the object as measured in its own (inertial) reference frame, and its argument as measured by us, in our own reference frame, is remarkable, and allows to understand the nature of the wavefunction in a more intuitive way. While this approach reflects Feynman’s idea of the photon stopwatch, the presentation in this booklet generalizes the concept for all wavefunctions, first and foremost the wavefunction of the matter-particles that we’re used to (e.g. electrons). II. Few, if any, have thought of looking at Schrödinger’s wave equation as an energy propagation mechanism. In fact, when helping my daughter out as she was trying to understand non-linear regression (logit and Poisson regressions), it suddenly realized we can analyze the wavefunction as a link function that connects two physical spaces: the physical space of our moving object, and a physical energy space. Re-inserting Planck’s quantum of action in the argument of the wavefunction – so we write θ as θ = (E/ħ)·t – (p/ħ)·x = [E·t – p·x]/ħ – we may assign a physical dimension to it: when interpreting ħ as a scaling factor only (and, hence, when we only consider its numerical value, not its physical dimension), θ becomes a quantity expressed in newton·meter·second, i.e. the (physical) dimension of action. It is only natural, then, that we would associate the real and imaginary part of the wavefunction with some physical dimension too, and a dimensional analysis of Schrödinger’s equation tells us this dimension must be energy. This perspective allows us to look at the wavefunction as an energy propagation mechanism, with the real and imaginary part of the probability amplitude interacting in very much the same way as the electric and magnetic field vectors E and B. This leads me to the next point, which I make rather emphatically in this booklet: the propagation mechanism for electromagnetic energy – as described by Maxwell’s equations – is mathematically equivalent to the propagation mechanism that’s implicit in the Schrödinger equation. I am, therefore, able to present the Schrödinger equation in a much more coherent way, describing not only how this famous equation works for electrons, or matter-particles in general (i.e. fermions or spin-1/2 particles), which is probably the only use of the Schrödinger equation you are familiar with, but also how it works for bosons, including the photon, of course, but also the theoretical zero-spin boson! In fact, I am personally rather proud of this. Not because I am doing something that hasn’t been done before (I am sure many have come to the same conclusions before me), but because one always has to trust one’s intuition. So let me say something about that third innovation: the photon wavefunction. III. Let me tell you the little story behind my photon wavefunction. One of my acquaintances is a retired nuclear scientist. While he knew I was delving into it all, I knew he had little time to answer any of my queries. However, when I asked him about the wavefunction for photons, he bluntly told me photons didn’t have a wavefunction. I should just study Maxwell’s equations and that’s it: there’s no wavefunction for photons: just this traveling electric and a magnetic field vector. Look at Feynman’s Lectures, or any textbook, he said. None of them talk about photon wavefunctions. That’s true, but I knew he had to be wrong. I mulled over it for several months, and then just sat down and started doing to fiddle with Maxwell’s equations, assuming the oscillations of the E and B vector could be described by regular sinusoids. And – Lo and behold! – I derived a wavefunction for the photon. It’s fully equivalent to the classical description, but the new expression solves the Schrödinger equation, if we modify it in a rather logical way: we have to double the diffusion constant, which makes sense, because E and B give you two waves for the price of one! In any case, I am getting ahead of myself here, and so I should wrap up this rather long introduction. Let me just say that, through my rather long journey in search of understanding – rather than knowledge alone – I have learned there are so many wrong answers out there: wrong answers that hamper rather than promote a better understanding. Moreover, I was most shocked to find out that such wrong answers are not the preserve of amateurs alone! This emboldened me to write what I write here, and to publish it. Quantum mechanics is a logical and coherent framework, and it is not all that difficult to understand. One just needs good pointers, and that’s what I want to provide here. As of now, it focuses on the mechanics in particular, i.e. the concept of the wavefunction and wave equation (better known as Schrödinger’s equation). The other aspect of quantum mechanics – i.e. the idea of uncertainty as implied by the quantum idea – will receive more attention in a later version of this document. I should also say I will limit myself to quantum electrodynamics (QED) only, so I won’t discuss quarks (i.e. quantum chromodynamics, which is an entirely different realm), nor will I delve into any of the other more recent advances of physics. In the end, you’ll still be left with lots of unanswered questions. However, that’s quite OK, as Richard Feynman himself was of the opinion that he himself did not understand the topic the way he would like to understand it. But then that’s exactly what draws all of us to quantum physics: a common search for a deep and full understanding of reality, rather than just some superficial description of it, i.e. knowledge alone. So let’s get on with it. I am not saying this is going to be easy reading. In fact, I blogged about much easier stuff than this in my blog—treating only aspects of the whole theory. This is the whole thing, and it’s not easy to swallow. In fact, it may well too big to swallow as a whole. But please do give it a try. I wanted this to be an intuitive but formally correct introduction to quantum math. However, when everything is said and done, you are the only who can judge if I reached that goal. Of course, I should not forget the acknowledgements but… Well… It was a rather lonely venture, so I am only going to acknowledge my wife here, Maria, who gave me all of the spacetime and all of the freedom I needed, as I would get up early, or work late after coming home from my regular job. I sacrificed weekends, which we could have spent together, and – when mulling over yet another paradox – the nights were often short and bad. Frankly, it’s been an extraordinary climb, but the view from the top is magnificent. I just need to insert one caution, my site (www.readingfeynman.org) includes animations, which make it much easier to grasp some of the mathematical concepts that I will be explaining. Hence, I warmly recommend you also have a look at that site, and its Deep Blue page in particular – as that page has the same contents, more or less, but the animations make it a much easier read. Jean Louis Van Belle, BA, MA, BPhil, Drs. Post scriptum note added on 11 July 2016: This is one of the more speculative posts which led to my e-publication analyzing the wavefunction as an energy propagation. With the benefit of hindsight, I would recommend you to immediately the more recent exposé on the matter that is being presented here, which you can find by clicking on the provided link. The argument of the wavefunction (i.e. θ = ωt – kx = [E·t – p·x]/ħ) is just the proper time of the object that’s being represented by the wavefunction (which, in most cases, is an elementary particle—an electron, for example). The 1/2 factor in Schrödinger’s equation (∂ψ/∂t = i·(ħ/2m)·∇2ψ) doesn’t make all that much sense, so we should just drop it. Writing ∂ψ/∂t = i·(m/ħ)∇2ψ (i.e. Schrödinger’s equation without the 1/2 factor) does away with the mentioned ambiguities and, more importantly, avoids obvious contradictions. Both remarks are rather unusual—especially the second one. 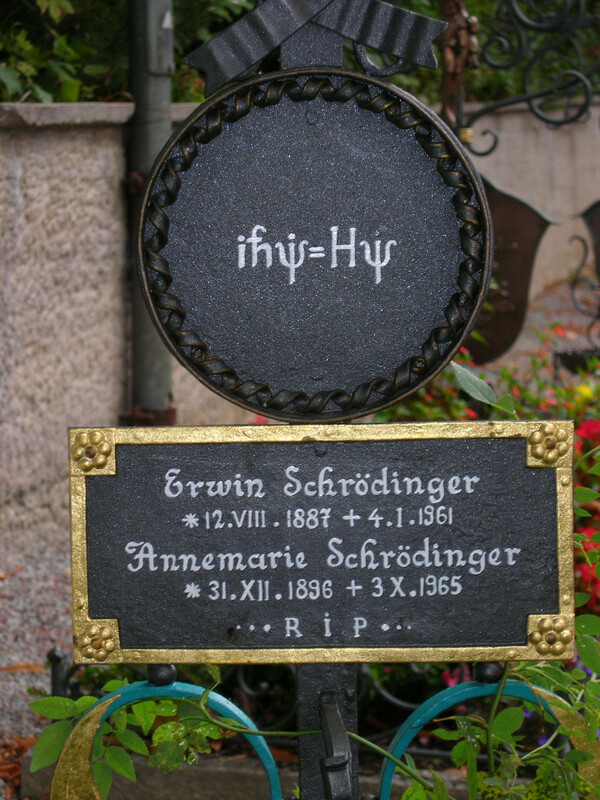 In fact, if you’re not shocked by what I wrote above (Schrödinger got something wrong! ), then stop reading—because then you’re likely not to understand a thing of what follows. 🙂 In any case, I thought it would be good to follow up by devoting a separate post to this matter. Huh? Yes. Let me show you how we get from θ = ωt – kx = [E·t – p·x]/ħ to θ = mv·t − p∙x. It’s really easy. We first need to choose our units such that the speed of light and Planck’s constant are numerically equal to one, so we write: c = 1 and ħ = 1. So now the 1/ħ factor no longer appears. Now, because we’re working in natural units, the numerical value of both c and c2 will be equal to 1. It’s obvious, then, that Einstein’s mass-energy equivalence relation reduces from E = mvc2 to E = mv. You can work out the rest yourself – noting that p = mv·v and mv = m0/√(1−v2). Done! For a more intuitive explanation, I refer you to the above-mentioned page. So that’s for the wavefunction. Let’s now look at Schrödinger’s wave equation, i.e. that differential equation of which our wavefunction is a solution. In my introduction, I bluntly said there was something wrong with it: that 1/2 factor shouldn’t be there. Why not? What’s wrong with Schrödinger’s equation? When deriving his famous equation, Schrödinger uses the mass concept as it appears in the classical kinetic energy formula: K.E. = m·v2/2, and that’s why – after all the complicated turns – that 1/2 factor is there. There are many reasons why that factor doesn’t make sense. Let me sum up a few. Huh? E = m∙v2? Yes. Not E = m∙c2 or m·v2/2 or whatever else you might be thinking of. In fact, this E = m∙v2 formula makes a lot of sense in light of the two following points. Notice that, to simplify the analysis above, I had moved the i and the ħ on the left-hand side to the right-hand side (note that 1/i = −i, so −(ħ2/2m)/(i·ħ) = ħ/2m). Now, the ħ2 factor on the right-hand side is expressed in J2·s2. Now that doesn’t make much sense, but then that mass factor in the denominator makes everything come out alright. Indeed, we can use the mass-equivalence relation to express m in J/(m/s)2 units. So our ħ2/2m coefficient is expressed in (J2·s2)/[J/(m/s)2] = J·m2. Now we multiply that by that Laplacian operating on some scalar, which yields some quantity per square meter. So the whole right-hand side becomes some amount expressed in joule, i.e. the unit of energy! Interesting, isn’t it? Well… You know that we can – and should – think of Schrödinger’s equation as a diffusion equation – just like a heat diffusion equation, for example – but then one describing the diffusion of a probability amplitude. [In case you are not familiar with this interpretation, please do check my post on it, or my Deep Blue page.] But then we didn’t describe the mechanism in very much detail, so let me try to do that now and, in the process, finally explain the problem with the 1/2 factor. You’ll say: so what? Well… Stop reading, I’d say. That p = 2m doesn’t make sense—at all! Nope! In fact, if you thought that the E = m·v2 is weird—which, I hope, is no longer the case by now—then… Well… This p = 2m equation is much weirder. In fact, it’s plain nonsense: this condition makes no sense whatsoever. The only way out is to remove the 1/2 factor, and to re-write the Schrödinger equation as I wrote it, i.e. with an ħ/m coefficient only, rather than an (1/2)·(ħ/m) coefficient. Let’s now go one step further and imagine a hypothetical particle with zero rest mass, so m0 = 0. Hence, all its energy is kinetic and so we write: K.E. = mv·v/2. Now, because this particle has zero rest mass, the slightest acceleration will make it travel at the speed of light. In fact, we would expect it to travel at the speed, so mv = mc and, according to the mass-energy equivalence relation, its total energy is, effectively, E = mv = mc. However, we just said its total energy is kinetic energy only. Hence, its total energy must be equal to E = K.E. = mc·c/2 = mc/2. So we’ve got only half the energy we need. Where’s the other half? Where’s the missing energy? Quid est veritas? Is its energy E = mc or E = mc/2? It’s just a paradox, of course, but one we have to solve. Of course, we may just say we trust Einstein’s E = m·c2 formula more than the kinetic energy formula, but that answer is not very scientific. 🙂 We’ve got a problem here and, in order to solve it, I’ve come to the following conclusion: just because of its sheer existence, our zero-mass particle must have some hidden energy, and that hidden energy is also equal to E = m·c2/2. Hence, the kinetic and the hidden energy add up to E = m·c2 and all is alright. Huh? Hidden energy? I must be joking, right? Back to that factor 1/2. As mentioned above, it also pops up when calculating the group and the phase velocity of the wavefunction. In fact, let me show you that calculation now. [Sorry. Just hang in there.] It goes like this. So that’s only half of v: it’s the 1/2 factor once more! Strange, isn’t it? Why would we get a different value for the phase velocity here? It’s not like we have two different frequencies here, do we? Well… No. You may also note that the phase velocity turns out to be smaller than the group velocity (as mentioned, it’s only half of the group velocity), which is quite exceptional as well! So… Well… What’s the matter here? We’ve got a problem! Let me make a small digression here that will make you feel even more confused. You know – or you should know – that the sine and the cosine function are the same except for a phase difference of 90 degrees: sinθ = cos(θ + π/2). Now, at the same time, multiplying something with i amounts to a rotation by 90 degrees, as shown below. So we have ħ/2 in both, not ħ. Why do we need to divide the quantum of action here? How do we solve all these paradoxes? It’s easy to see how: the apparent contradiction (i.e. the different group and phase velocity) gets solved if we’d use the E = m∙v2 formula rather than the kinetic energy E = m∙v2/2. But then… What energy formula is the correct one: E = m∙v2 or m∙c2? Einstein’s formula is always right, isn’t it? It must be, so let me postpone the discussion a bit by looking at a limit situation. If v = c, then we don’t need to make a choice, obviously. 🙂 So let’s look at that limit situation first. So we’re discussing our zero-mass particle once again, assuming it travels at the speed of light. What do we get? Same result! No factor 1/2 here! Isn’t that great? My ‘hidden energy theory’ makes a lot of sense. Indeed, the skeptics among you may wonder whether our zero-mass particle wavefunction makes any sense at all, and they should do so for the following reason: if x = 0 at t = 0, and it’s traveling at the speed of light, then x(t) = t. Always. So if E = m = p, the argument of our wavefunction becomes E·t – p·x = E·t – E·t = 0! So what’s that? The proper time of our zero-mass particle is zero—always and everywhere!? As a constant of proportionality, it quantifies the relationship between both derivatives. As a physical constant, it ensures the dimensions on both sides of the equation are compatible. So the diffusion constant for Schrödinger’s equation is ħ/m. What is its dimension? That’s easy: (N·m·s)/(N·s2/m) = m2/s. [Remember: 1 N = 1 kg·m/s2.] But then we multiply it with the Laplacian, so that’s something expressed per square meter, so we get something per second on both sides. So that’s structurally similar to Schrödinger’s equation, and to the two equivalent equations we jotted down above. So we’ve got T (temperature) in the role of ψ here—or, to be precise, in the role of ψ ‘s real and imaginary part respectively. So what’s temperature? From the kinetic theory of gases, we know that temperature is not just a scalar: temperature measures the mean (kinetic) energy of the molecules in the gas. That’s why we can confidently state that the heat diffusion equation models an energy flow, both in space as well as in time. Let me make the point by doing the dimensional analysis for that heat diffusion equation. The time derivative on the left-hand side (∂T/∂t) is expressed in K/s (Kelvin per second). Weird, isn’t it? What’s a Kelvin per second? Well… Think of a Kelvin as some very small amount of energy in some equally small amount of space—think of the space that one molecule needs, and its (mean) energy—and then it all makes sense, doesn’t it? However, in case you find that a bit difficult, just work out the dimensions of all the other constants and variables. The constant in front (k) makes sense of it. That coefficient (k) is the (volume) heat capacity of the substance, which is expressed in J/(m3·K). So the dimension of the whole thing on the left-hand side (k·∂T/∂t) is J/(m3·s), so that’s energy (J) per cubic meter (m3) and per second (s). Nice, isn’t it? What about the right-hand side? On the right-hand side we have the Laplacian operator – i.e. ∇2 = ∇·∇, with ∇ = (∂/∂x, ∂/∂y, ∂/∂z) – operating on T. The Laplacian operator, when operating on a scalar quantity, gives us a flux density, i.e. something expressed per square meter (1/m2). In this case, it’s operating on T, so the dimension of ∇2T is K/m2. Again, that doesn’t tell us very much (what’s the meaning of a Kelvin per square meter?) but we multiply it by the thermal conductivity (κ), whose dimension is W/(m·K) = J/(m·s·K). Hence, the dimension of the product is the same as the left-hand side: J/(m3·s). So that’s OK again, as energy (J) per cubic meter (m3) and per second (s) is definitely something we can associate with an energy flow. In fact, we can play with this. We can bring k from the left- to the right-hand side of the equation, for example. The dimension of κ/k is m2/s (check it! ), and multiplying that by K/m2 (i.e. the dimension of ∇2T) gives us some quantity expressed in Kelvin per second, and so that’s the same dimension as that of ∂T/∂t. Done! In fact, we’ve got two different ways of writing Schrödinger’s diffusion equation. We can write it as ∂ψ/∂t = i·(ħ/m)·∇2ψ or, else, we can write it as ħ·∂ψ/∂t = i·(ħ2/m)·∇2ψ. Does it matter? I don’t think it does. The dimensions come out OK in both cases. However, interestingly, if we do a dimensional analysis of the ħ·∂ψ/∂t = i·(ħ2/m)·∇2ψ equation, we get joule on both sides. Interesting, isn’t it? The key question, of course, is: what is it that is flowing here? And then we can divide both sides by m, so then we get N·s on both sides, so that’s momentum. So then Schrödinger’s equation embodies the momentum conservation law. Isn’t it just wonderful? Schrödinger’s equation packs all of the conservation laws! The only catch is that it flows back and forth from the real to the imaginary space, using that propagation mechanism as described in those two equations. OK. You’re right. I still haven’t answered the fundamental question. So what about the 1/2 factor? What about that 1/2 factor? Did Schrödinger miss it? Well… Think about it for yourself. First, I’d encourage you to further explore that weird graph with the real and imaginary part of the wavefunction. I copied it below, but with an added 45º line—yes, the green diagonal. To make it somewhat more real, imagine you’re the zero-mass point-like particle moving along that line, and we observe you from our inertial frame of reference, using equivalent time and distance units. So we’ve got that cosine (cosθ) varying as you travel, and we’ve also got the i·sinθ part of the wavefunction going while you’re zipping through spacetime. Now, THINK of it: the phase velocity of the cosine bit (i.e. the red graph) contributes as much to your lightning speed as the i·sinθ bit, doesn’t it? Should we apply Pythagoras’ basic r2 = x2 + y2 Theorem here? Yes: the velocity vector along the green diagonal is going to be the sum of the velocity vectors along the horizontal and vertical axes. So… That’s great. So, as mentioned, we’re adding the vectors, but not their magnitudes. We’re somewhat better off than we were in terms of showing that the phase velocity of those sine and cosine velocities add up—somehow, that is—but… Well… We’re not quite there. So… I still haven’t answered that question. Should that 1/2 factor in Schrödinger’s equation be there or not? The answer is, obviously: yes. It should be there. And as for Schrödinger using the mass concept as it appears in the classical kinetic energy formula: K.E. = m·v2/2… Well… What other mass concept would he use? I probably got a bit confused with Feynman’s exposé – especially this notion of ‘choosing the zero point for the energy’ – but then I should probably just re-visit the thing and adjust the language here and there. But the formula is correct. Thinking it all through, the ħ/2m constant in Schrödinger’s equation should be thought of as the reciprocal of m/(ħ/2). So what we’re doing basically is measuring the mass of our object in units of ħ/2, rather than units of ħ. That makes perfect sense, if only because it’s ħ/2, rather than ħthe factor that appears in the Uncertainty Relations Δx·Δp ≥ ħ/2 and ΔE·Δt ≥ ħ/2. In fact, in my post on the wavefunction of the zero-mass particle, I noted its elementary wavefunction should use the m = E = p = ħ/2 values, so it becomes ψ(x, t) = a·e−i∙[(ħ/2)∙t − (ħ/2)∙x]/ħ = a·e−i∙[t − x]/2. ⇔ 1/2 = 1/4 !? ⇔ 1 = 1/2 !? Why are we not surprised? The series represent the energy values that a spin one-half particle can possibly have, and ordinary matter – i.e. all fermions – is composed of spin one-half particles. This post is about something I promised to write about aeons ago: how do we get those electron orbitals out of Schrödinger’s equation? So let me write it now – for the simplest of atoms: hydrogen. I’ll largely follow Richard Feynman’s exposé on it: this text just intends to walk you through it and provide some comments here and there. Let me first remind you that ψ is a function of position in space and time, so we write: ψ = ψ(x, y, z, t) = ψ(r, t), with (x, y, z) = r. And m, on the other side of the equation, is what it always was: the effective electron mass. Now, we talked about the subtleties involved before, so let’s not bother about the definition of the effective electron mass, or wonder where that factor 1/2 comes from here. What about V? V is the potential energy of the electron: it depends on the distance (r) from the proton. We write: V = −e2/│r│ = −e2/r. Why the minus sign? Because we say the potential energy is zero at large distances (see my post on potential energy). Back to Schrödinger’s equation. On the left-hand side, we have ħ, and its dimension is J·s (or N·m·s, if you want). So we multiply that with a time derivative and we get J, the unit of energy. On the right-hand side, we have Planck’s constant squared, the mass factor in the denominator, and the Laplacian operator – i.e. ∇2 = ∇·∇, with ∇ = (∂/∂x, ∂/∂y, ∂/∂z) – operating on the wavefunction. Feynman then injects one of these enigmatic phrases—enigmatic for novices like us, at least! Writing the coefficient in front of the complex exponential as ψ(r) = a·ei·(p/ħ)·x] does the trick we want it to do: we do not want that coefficient to depend on time: it should only depend on the size of our ‘box’ in space, as I explained in one of my posts. So now we need to solve that differential equation, i.e. we need to find functional forms for ψ – and please do note we’re talking ψ(r) here – not ψ(r, t)! – that satisfy the above equation. Interesting question: is our equation still Schrödinger’s equation? Well… It is and it isn’t. Any linear combination of the definite energy solutions we find will also solve Schrödinger’s equation, but so we limited the solution set here to those definite energy solutions only. Hence, it’s not quite the same equation. We removed the time dependency here – and in a rather interesting way, I’d say. The interesting thing is that the spherically symmetric solutions yield real-valued ψ(r) functions. The solutions for n = 1, 2, and 3 respectively, and their graph is given below. We might say the ψ(r) function is sort of an envelope function for the whole wavefunction, but it’s not quite as straightforward as that. However, I am sure you’ll figure it out. We’ve got a whole range of definite energy states, which correspond to orbitals that form an orthonormal basis for the actual wavefunction of the electron. The m is referred to as the ‘magnetic’ quantum number, and it ranges from −l to +l. The n is the ‘principle’ quantum number, and it goes from l + 1 to infinity (∞). How do these things actually look like? Let me insert two illustrations here: one from Feynman, and the other from Wikipedia. So… Where were we? Oh… Yes. The de Broglie relation. Popular textbooks usually commit two sins. One is that they forget to say we have two de Broglie relations, and the other one is that the E = h∙f relationship is presented as the twin of the Planck-Einstein relation for photons, which relates the energy (E) of a photon to its frequency (ν): E = h∙ν = ħ∙ω. The former is criminal neglect, I feel. As for the latter… Well… It’s true and not true: it’s incomplete, I’d say, and, therefore, also very confusing. Why? Because both things lead one to try to relate the two equations, as momentum and energy are obviously related. In fact, I’ve wasted days, if not weeks, on this. How are they related? What formula should we use? To answer that question, we need to answer another one: what energy concept should we use? Potential energy? Kinetic energy? Should we include the equivalent energy of the rest mass? But… Well… E = m∙v2? How could we possibly justify the use of that formula? The answer is simple: our v = f·λ equation is wrong. It’s just something one shouldn’t apply to the complex-valued wavefunction. The ‘correct’ velocity formula for the complex-valued wavefunction should have that 1/2 factor, so we’d write 2·f·λ = v to make things come out alright. But where would this formula come from? Well… Now it’s time to introduce the wavefunction. So the question is: why can’t we use the v = f·λ formula for this wave? The period of cosθ + isinθ is the same as that of the sine and cosine function considered separately: cos(θ+2π) + isin(θ+2π) = cosθ + isinθ, so T = 2π and f = 1/T = 1/2π do not change. So the f, T and λ should be the same, no? No. We’ve got two oscillations for the price of one here: one ‘real’ and one ‘imaginary’—but both are equally essential and, hence, equally ‘real’. So we’re actually combining two waves. So it’s just like adding other waves: when adding waves, one gets a composite wave that has (a) a phase velocity and (b) a group velocity. ω and k may be directly proportional, so we can write ω as ω = a∙k: in that case, we find that vp = vg = a.
ω and k are not directly proportional but have a linear relationship, so we can write write ω as ω = a∙k + b. In that case, we find that vg = a and… Well… We’ve got a problem calculating vp, because we don’t know what k to use! Let’s now look back at our ei(kx − ωt) = cos(kx−ωt) + i∙sin(kx−ωt) function. You’ll say that we’ve got only one ω and one k here, so we’re not adding waves with different ω’s and k’s. So… Well… What? So that factor 1/2 only appears for the phase velocity. Weird, isn’t it? We find that the group velocity (vg) of the ei(kx − ωt) function is equal to the classical velocity of our particle (i.e. v), but that its phase velocity (vp) is equal to v divided by 2. Hmm… What to say? Well… Nothing much—except that it makes sense, and very much so, because it’s the group velocity of the wavefunction that’s associated with the classical velocity of a particle, not the phase velocity. In fact, if we include the rest mass in our energy formula, so if we’d use the relativistic E = γm0c2 and p = γm0v formulas (with γ the Lorentz factor), then we find that vp = ω/k = E/p = (γm0c2)/(γm0v) = c2/v, and so that’s a superluminal velocity, because v is always smaller than c! What? That’s even weirder! If we take the kinetic energy only, we find a phase velocity equal to v/2, but if we include the rest energy, then we get a superluminal phase velocity. It must be one or the other, no? Yep! You’re right! So that makes us wonder: is E = m·v2/2 really the right energy concept to use? The answer is unambiguous: no! It isn’t! And, just for the record, our young nobleman didn’t use the kinetic energy formula when he postulated his equations in his now famous PhD thesis. So what did he use then? Where did he get his equations? I am not sure. 🙂 A stroke of genius, it seems. According to Feynman, that’s how Schrödinger got his equation too: intuition, brilliance. In short, a stroke of genius. 🙂 Let’s relate these these two gems. The particle’s kinetic energy, which we wrote in terms of its momentum p: K.E. = m·v2/2 = m2·v2/(2m) = (m·v)2/(2m) = p2/(2m). In those post – such as my post on virtual particles – I’d also note how a change in potential energy plays out: a change in potential energy, when moving from one place to another, would change the wavefunction, but through the momentum only—so it would impact the spatial frequency only. So the change in potential would not change the temporal frequencies ω1 = Eint + p12/(2m) + V1 and ω1 = Eint + p22/(2m) + V2. Why? Or why not, I should say? Because of the energy conservation principle—or its equivalent in quantum mechanics. The temporal frequency f or ω, i.e. the time-rate of change of the phase of the wavefunction, does not change: all of the change in potential, and the corresponding change in kinetic energy, goes into changing the spatial frequency, i.e. the wave number k or the wavelength λ, as potential energy becomes kinetic or vice versa. The only thing that’s missing now is the particle’s rest energy m0c2, which de Broglie referred to as internal energy (Eint). That includes everything, i.e. not only the rest mass of the ‘internal pieces’ (as said, now we call those ‘internal pieces’ quarks) but also their binding energy (i.e. the quarks’interaction energy). So how do we get that energy concept out of Schrödinger’s equation? There’s only one answer to that: that energy is just like V. We can, quite simply, just add it. It’s now pretty clear how this thing works. To localize our particle, we just superimpose a zillion of these e−i(ωt − kx) equations. The only condition is that we’ve got that fixed vg = dω/dk = v relationhip, but so we do have such fixed relationship—as you can see above. In fact, the Wikipedia article on the dispersion relation mentions that the de Broglie equations imply the following relation between ω and k: ω = ħk2/2m. As you can see, that’s not entirely correct: the author conveniently forgets the potential (V) and the rest energy (Eint) in the energy formula here! I should make one final point here. As said, in order to localize a particle (or, to be precise, its wavefunction), we’re going to add a zillion elementary wavefunctions, each of which will make its own contribution to the composite wave. That contribution is captured by some coefficient ai in front of every e−iθi function, so we’ll have a zillion aie−iθi functions, really. [Yep. Bit confusing: I use i here as subscript, as well as imaginary unit.] In case you wonder how that works out with Schrödinger’s equation, the answer is – once again – very simple: both the time derivative (which is just a first-order derivative) and the Laplacian are linear operators, so Schrödinger’s equation, for a composite wave, can just be re-written as the sum of a zillion ‘elementary’ wave equations. So… Well… We’re all set now to effectively use Schrödinger’s equation to calculate the orbitals for a hydrogen atom, which is what we’ll do in our next post. Note: Notations are often quite confusing. One should, generally speaking, denote a frequency by ν (nu), rather than by f, so as to not cause confusion with any function f, but then… Well… You create a new problem when you do that, because that Greek letter nu (ν) looks damn similar to the v of velocity, so that’s why I’ll often use f when I should be using nu (ν). As for the units, a frequency is expressed in cycles per second, while the angular frequency ω is expressed in radians per second. One cycle covers 2π radians and, therefore, we can write: ν = ω/2π. Hence, h∙ν = h∙ω/2π = ħ∙ω. Both ν as well as ω measure the time-rate of change of the phase of the wave function, as opposed to k, i.e. the spatial frequency of the wave function, which depends on the speed of the wave. Physicists also often use the symbol v for the speed of a wave, which is also hugely confusing, because it’s also used to denote the classical velocity of the particle. And then there’s two wave velocities, of course: the group versus the phase velocity. In any case… I find the use of that other symbol (c) for the wave velocity even more confusing, because this symbol is also used for the speed of light, and the speed of a wave is not necessarily (read: usually not) equal to the speed of light. In fact, both the group as well as the phase velocity of a particle wave are very different from the speed of light. The speed of a wave and the speed of light only coincide for electromagnetic waves and, even then, it should be noted that photons also have amplitudes to travel faster or slower than the speed of light. We climbed a mountain—step by step, post by post. 🙂 We have reached the top now, and the view is gorgeous. We understand Schrödinger’s equation, which describes how amplitudes propagate through space-time. It’s the quintessential quantum-mechanical expression. Let’s enjoy now, and deepen our understanding by introducing the concept of (quantum-mechanical) operators. The ∇2 operator, which you know: it’s a differential operator. To be specific, it’s the Laplace operator, which is the divergence (∇·) of the gradient (∇) of a function: ∇2 = ∇·∇ = (∂/∂x, ∂/∂y , ∂/∂z)·(∂/∂x, ∂/∂y , ∂/∂z) = ∂2/∂x2 + ∂2/∂y2 + ∂2/∂z2. This too operates on our complex-valued function wavefunction ψ, and yields some other complex-valued function, which we then multiply by −ħ2/2m to get the first term. The V(x, y, z) ‘operator’, which—in this particular context—just means: “multiply with V”. Needless to say, V is the potential here, and so it captures the presence of external force fields. Also note that V is a real number, just like −ħ2/2m. That equation illustrated the physical significance of the Laplacian. We were talking about the flow of heat in, say, a block of metal, as illustrated below. The q in the equation above is the heat per unit volume, and the h in the illustration below was the heat flow vector (so it’s got nothing to do with Planck’s constant), which depended on the material, and which we wrote as h = –κ∇T, with T the temperature, and κ (kappa) the thermal conductivity. In any case, the point is the following: the equation below illustrates the physical significance of the Laplacian. We let it operate on the temperature (i.e. a scalar function) and its product with some constant (just think of replacing κ by −ħ2/2m gives us the time derivative of q, i.e. the heat per unit volume. From a mathematical point of view, that equation is just the same as ∂ψ/∂t = –(i·ħ/2m)·∇2ψ, which is Schrödinger’s equation for V = 0. In other words, you can – and actually should – also think of Schrödinger’s equation as describing the flow of… Well… What? Now that we’ve introduced the concept of an operator, let me say something about notations, because that’s quite confusing. In any case, this discussion on the use (or not) of that hat is irrelevant. In contrast, what is relevant is to realize this algebraic operator H here is very different from that other quantum-mechanical Hamiltonian operator we discussed when dealing with a finite set of base states: that H was the Hamiltonian matrix, but used in an ‘operation’ on some state. So we have the matrix operator H, and the algebraic operator H.
If your ‘space’ is continuous (i.e. if states are to defined with reference to an infinite set of base states), then it’s the algebraic operator. If, on the other hand, your states are defined by some finite set of discrete base states, then it’s the Hamiltonian matrix. There’s another, more fundamental, reason why there should be no confusion. In fact, it’s the reason why physicists use the same symbol H in the first place: despite the fact that they look so different, these two operators (i.e. H the algebraic operator and H the matrix operator) are actually equivalent. Their interpretation is similar, as evidenced from the fact that both are being referred to as the energy operator in quantum physics. The only difference is that one operates on a (state) vector, while the other operates on a continuous function. It’s just the difference between matrix mechanics as opposed to wave mechanics really. Let’s think about |ψ〉. It is the state of a system, like the ground state of a hydrogen atom, or one of its many excited states. But… Well… It’s a bit of a weird term, really. It all depends on what you want to measure: when we’re thinking of the ground state, or an excited state, we’re thinking energy. That’s something else than thinking its position in space, for example. Always remember: a state is defined by a set of base states, and so those base states come with a certain perspective: when talking states, we’re only looking at some aspect of reality, really. Let’s continue with our example of energy states, however. You know that the lifetime of a system in an excited state is usually short: some spontaneous or induced emission of a quantum of energy (i.e. a photon) will ensure that the system quickly returns to a less excited state, or to the ground state itself. However, you shouldn’t think of that here: we’re looking at stable systems here. To be clear: we’re looking at systems that have some definite energy—or so we think: it’s just because of the quantum-mechanical uncertainty that we’ll always measure some other different value. Does that make sense? If it doesn’t… Well… Stop reading, because it’s only going to get even more confusing. Not my fault, however! If a particle is in some state |ψ〉, then we can associate some wavefunction ψ(x) or φ(p)—with it, and that wavefunction will represent the amplitude for the system (i.e. our particle) to be at x, or to have a momentum that’s equal to p.
So what’s wrong with that? Well… Nothing. It’s just that… Well… Why don’t they use χ(x) instead of ψ(x)? That would avoid a lot of confusion, I feel: one should not use the same symbol (psi) for the |ψ〉 state and the ψ(x) wavefunction. Now, I wrote this post to talk about quantum-mechanical operators, so let me do that now. We then say that A is a ‘self-adjoint’ or ‘Hermitian’ operator. That’s just a definition of a property, which the operator may or may not have—but many quantum-mechanical operators are actually Hermitian. In any case, we’re well armed now to discuss some actual operators, and we’ll start with that energy operator. The energies EI, EII,…, En,…, EN are the eigenvalues of the Hamiltonian matrix H.
The state vectors |n〉 that are associated with each energy En, i.e. the set of vectors |n〉, are the corresponding eigenstates. Huh? Yes. Note the difference between |ψ〉 = ∑ |ηi〉 Ci = ∑ |ηi〉〈ηi|ψ〉 and |φ〉 = ∑ |ηi〉Ei〈ηi|ψ〉. As Feynman puts it: φ is just some ‘cooked-up‘ state which you get by taking each of the base states |ηi〉 in the amount Ei〈ηi|ψ〉 (as opposed to the 〈ηi|ψ〉 amounts we took for ψ). Huh? Yes! To get the average energy, you operate on |ψ〉 with H, and then you multiply the result with 〈ψ|. It’s a beautiful formula. On top of that, the new formula for the average energy is not only pretty but also useful, because now we don’t need to say anything about any particular set of base states. We don’t even have to know all of the possible energy levels. When we have to calculate the average energy of some system, we only need to be able to describe the state of that system in terms of some set of base states, and we also need to know the Hamiltonian matrix for that set, of course. But if we know that, we can calculate its average energy. You’ll say that’s not a big deal because… Well… If you know the Hamiltonian, you know everything, so… Well… Yes. You’re right: it’s less of a big deal than it seems. Having said that, the whole development above is very interesting because of something else: we can easily generalize it for other physical measurements. I call it the ‘average value’ operator idea, but you won’t find that term in any textbook. 🙂 Let me explain the idea. OK. So far, so good. The next step is to look at how this works for the continuity case. You’ll say that doesn’t look like 〈Eav〉 = 〈 ψ | H | ψ 〉! It does. Remember that 〈 ψ | = | ψ 〉*. 🙂 Done! The thing we need to solve here is really easy. Look at the illustration below as representing the probability density of some particle being at x. Think about it: what’s the average position? That looks exactly the same as 〈E〉av = ∫ ψ*(x) H ψ(x) dx, and so we can look at x as an operator too! The two probability density functions, φ(p) and ψ(x), look pretty much the same, but the half-width (or standard deviation) of one was inversely proportional to the half-width of the other. To be precise, we found that the constant of proportionality was equal to ħ/2, and wrote that relation as follows: σp = (ħ/2)/σx. We also found that, when using a regular normal distribution function for ψ(x), we’d have to normalize the probability density function by inserting a (2πσx2)−1/2 in front of the exponential. The generalization of Schrödinger’s equation to three dimensions (in space) and also including the presence of external force fields (as opposed to the usual ‘free space’ assumption). Needless to say, the base states i and j are rather special vectors in a rather special mathematical space (a so-called Hilbert space) and so it’s rather tricky to interpret their ‘orthogonality’ in any geometric way, although such geometric interpretation is often actually possible in simple quantum-mechanical systems: you’ll just notice a ‘right’ angle may actually be 45°, or 180° angles, or whatever. 🙂 In any case, that’s not the point here. The question is: if we move an infinite number of base states – like we did when we introduced the ψ(x) and φ(p) wavefunctions – what happens to that condition? However, when moving from a space with a finite number of dimensions to a space with an infinite number of dimensions, there are some issues. They pop up, for example, when we insert that 〈 x | x’ 〉 = δxx’ function (note that we’re talking some function here of x and x’, indeed, so we’ll write it as f(x, x’) in the next step) in that 〈φ|ψ〉 = ∫〈φ|x〉〈x|ψ〉dx integral. You’ll say: what’s the problem? Well… From a mathematical point of view, it’s a bit difficult to find a function 〈x’|x〉 = f(x, x’) which, when multiplied with a wavefunction ψ(x), and integrated over all x, will just give us ψ(x’). A bit difficult? Well… It’s worse than that: it’s actually impossible! This is a weird expression: the value of the integral (i.e. the right-hand side of the expression) does not depend on x: it is just some non-zero value ψ(0). However, we know that the f(x) in the integrand is zero for all x ≠ 0. Hence, this integral will be zero. So we have an impossible situation: we wish a function to be zero everywhere but for one point, and, at the same time, we also want it to give us a finite integral when using it in that integral above. I will also credit Wikipedia with the following animation, which shows that the expression above is just the normal distribution function, and which shows what happens when that a, i.e. its standard deviation, goes to zero: Dirac’s delta function is just the limit of a sequence of (zero-centered) normal distributions. That’s all. Nothing more, nothing less. As a result, integrals over x, become integrals over x, y and z. In other words, they become volume integrals. Suppose there are two particles, which we can call particle 1 and particle 2. What shall we use for the base states? One perfectly good set can be described by saying that particle 1 is at x1 and particle 2 is at x2, which we can write as | x1 x2 〉. Notice that describing the position of only one particle does not define a base state. Each base state must define the condition of the entire system, so you must not think that each particle moves independently as a wave in three dimensions. Any physical state | ψ 〉 can be defined by giving all of the amplitudes 〈 x1 x2 | ψ 〉 to find the two particles at x1 and x2. This generalized amplitude is therefore a function of the two sets of coordinates x1 and x1. You see that such a function is not a wave in the sense of an oscillation that moves along in three dimensions. Neither is it generally simply a product of two individual waves, one for each particle. It is, in general, some kind of a wave in the six dimensions defined by x1 and x1. Hence, if there are two particles in Nature which are interacting, there is no way of describing what happens to one of the particles by trying to write down a wave function for it alone. The famous paradoxes that we considered in earlier chapters—where the measurements made on one particle were claimed to be able to tell what was going to happen to another particle, or were able to destroy an interference—have caused people all sorts of trouble because they have tried to think of the wave function of one particle alone, rather than the correct wave function in the coordinates of both particles. The complete description can be given correctly only in terms of functions of the coordinates of both particles. Now, even Feynman struggles a bit with the definition of E0 and k here, and their relationship with E, which is graphed below. The particle’s rest energy m0c2, which de Broglie referred to as internal energy (Eint), and which includes the rest mass of the ‘internal pieces’, as Feynman puts it (now we call those ‘internal pieces’ quarks), as well as their binding energy (i.e. the quarks’ interaction energy). Any potential energy it may have because of some field (i.e. if it is not traveling in free space), which we usually denote by U. This field can be anything—gravitational, electromagnetic: it’s whatever changes the energy of the particle because of its position in space. It’s obvious that we cannot just “choose” the zero point here: the particle’s rest energy is its rest energy, and its velocity is its velocity. So it’s not quite clear what the E0 in our model really is. As far as I am concerned, it represents the average energy of the system really, so it’s just like the E0 for our ammonia molecule, or the E0 for whatever two-state system we’ve seen so far. In fact, when Feynman writes that we can “choose our zero of energy so that E0 − 2A = 0″ (so the minimum of that curve above is at the zero of energy), he actually makes some assumption in regard to the relative magnitude of the various amplitudes involved. Hence, in my humble opinion, Feynman’s assumption that E0 − 2A = 0 has nothing to do with ‘choosing the zero of energy’. It’s more like a symmetry assumption: we’re basically saying it’s as likely for the electron to stay where it is as it is to move to the next position. It’s an idea I need to develop somewhat further, as Feynman seems to just gloss over these little things. For example, I am sure it is not a coincidence that the EI, EII, EIII and EIV energy levels we found when discussing the hyperfine splitting of the hydrogen ground state also add up to 0. In fact, you’ll remember we could actually measure those energy levels (EI = EII = EIII = A ≈ 9.23×10−6 eV, and EIV = −3A ≈ −27.7×10−6 eV), so saying that we can “choose” some zero energy point is plain nonsense. The question just doesn’t arise. In any case, as I have to continue the development here, I’ll leave this point for further analysis in the future. So… Well… Just note this E0 − 2A = 0 assumption, as we’ll need it in a moment. Now, you should check my post scriptum to my page on the Essentials, to see how the probability density function of the cosine of a randomly distributed variable looks like, and then you should go online to find a formula for its variance, and then you can work it all out yourself, because… Well… I am not going to do it for you. What I want to do here is just show how Feynman gets Schrödinger’s equation out of all of these simplifications. The classical formula (p = m·v) tells us that the momentum is proportional to the classical velocity of our particle, and m is then the factor of proportionality. To do so, we need one more assumption. It’s the third major simplification and, just like the others, the assumption is obvious on first, but not on second thought. 😦 So… What is it? Well… It’s easy to see that, in our meff = ħ2/(2Ab2) formula, all depends on the value of 2Ab2. So, just like we should wonder what happens with that kb factor in the argument of our sine or cosine function if b goes to zero—i.e. if we’re letting the lattice spacing go to zero, so we’re moving from a discrete to a continuous analysis now—we should also wonder what happens with that 2Ab2 factor! Well… Think about it. Wouldn’t it be reasonable to assume that the effective mass of our electron is determined by some property of the material, or the medium (so that’s the silicon in our previous post) and, hence, that it’s constant really. Think of it: we’re not changing the fundamentals really—we just have some electron roaming around in some medium and all that we’re doing now is bringing those xn closer together. Much closer. It’s only logical, then, that our amplitude to jump from xn±1 to xn would also increase, no? So what we’re saying is that 2Ab2 is some constant which we write as ħ2/meff or, what amounts to the same, that Ab2 = ħ2/2·meff. The Ab2 = ħ2/2·meff assumption establishes a very particular relation between A and b, as we can write A as A = [ħ2/(2meff)]·b−2 now. So we’ve got like an y = 1/x2 relation here. Where the hell does that come from? We were talking some real stuff here: a crystal lattice with atoms that, in reality, do have some spacing, so that corresponds to some real value for b. So that spacing gives some actual physical significance to those xn values.